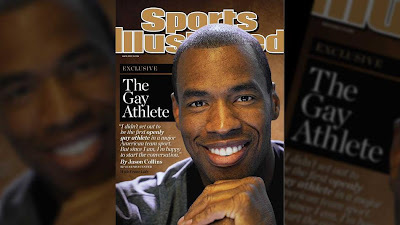 NickLannon.com: Can Jason Collins Be A Christian? Can Jason Collins Be A Christian? The big news in the sports world this week is that Jason Collins (a 34-year-old free agent center most recently of the Washington Wizards) has announced that he's gay. This makes him the first active (as long as he's signed by an NBA franchise for next season) openly homosexual male athlete in one of America's "Big Four" professional sports leagues (NBA, NFL, MLB, and NHL). The sports talk-o-sphere has been falling all over itself for the last 48 hours to make sure that no corner of this story goes un-peeked-under. To his credit, Broussard doesn't set out to question Collins' Christianity. He doesn't even bring his own beliefs into the mix until Granderson mentions that they're on "opposite ends of the spectrum" of this debate. However, he can't be given a pass on what he eventually says, which is that Collins, because of his life of "open rebellion to God," can't be a Christian. Broussard claims that, "If you're openly living in unrepentant sin, whatever it may be...I believe that's walking in open rebellion to God and to Jesus Christ, so I would not characterize that person as a Christian because I don't think the Bible would characterize them as a Christian." Christians are beset by the same malady that afflicts non-Christians: we are human. Paul dealt with a thorn in his flesh from which he begged to be freed (1 Corinthians 12:7). He recognizes the Corinthian Christians as "enriched," "not lacking in any spiritual gift," and "sanctified in Christ Jesus" (1 Corinthians 1:2-7) while at the same time describing their sins as "of a kind not even the pagans tolerate" (1 Corinthians 5:1). They're suing each other (6:1) and denying the resurrection of the dead (chapter 15), but Paul says with full confidence that they "will be blameless on the day of our Lord Jesus Christ" (1:8). The message of the Bible is clear: we are all sheep who have wandered away (Luke 15:3-7). Far from disqualifying us for Christianity, this sorry state puts Jesus' crosshairs directly on us! He searches diligently until he finds us, puts us on his shoulders, carries us home, and celebrates with us. But even this most peaceful of stories doesn't do the real story justice: God made Christ, who knew no sin, to be sin for us, so that we, the rebellious sinners, could become the righteousness of God (2 Corinthians 5:21). I'm grateful that Jason Collins can be a Christian. It means that I can be one, too. Nick, I wish there were voices like yours among the Christian talking-heads on this issue. Unfortunately, that's not how it tends to go on CNN/FOX/ESPN/MSNBC. Most of the Christians who can speak with nuance, intelligence, and compassion on this subject either aren't asked for their opinion, or if they are, they say they won't touch the subject with a 10 foot pole - hard to blame them, but we need someone like that to step up to be as "bold" as Jason Collins has been said to be.